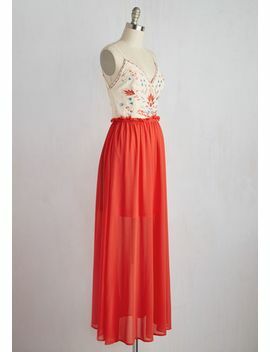 The gorgeous details of this sleeveless maxi dress from our ModCloth namesake label make their entrance known. Beneath the V-neckline of this silky, woven gown, a pleated waist gives depth and dimension to the A-line silhouette. An abstract, watercolor motif in deep pink and neutral hues adds to the majesty of this stunning piece, lending sophistication to your every salutation.